The Beaver Builder Theme supports a widget footer and a main footer. The widget footer appears above the main footer and can contain up to 4 widget areas. The main footer consists of one or two columns with several content options. Tip: If you use the Beaver Builder Theme, there is a [fl_year] shortcode that you can use to insert the current date into any text area of the Beaver Builder Theme Customizer or into your Beaver Builder layouts. For more information, see the Related Article on the Beaver Builder Theme date shortcode. You can set the footer widgets area to appear on all pages, just the home page, or not at all. If you enable the footer widgets area, choose which widgets to use in Customize > Widgets. See the Related Articles for more information. Tip: If you want to enable or disable footer widgets on particular pages, instead of this footer widget you could create a footer row in Page Builder, containing either widgets or content, and save it as a Global module, then use it in the pages where you want the footer widgets to appear. You can set a background color or image, with associated style settings. You can set text color, link color, and hover color. Enable or disable a main footer. The Beaver Builder Theme’s footer supports up to two columns. Either column can contain text, social icons, both text and social icons, or a WordPress menu. Tip: As of Beaver Builder Theme Version 1.6.5, you can insert the current year or current date as a shortcode. Choose Text as the layout type. For information, and examples, see the Related Article below on Beaver Builder Theme shortcode for the current date. If you choose Menu, go to Customize > Menus > Menu Locations. For the Footer Menu setting, choose which menu you want to display. If you don't set a menu for the footer, Page Builder will detect it, and you will see a Choose menu link in the footer of any Page Builder page you are editing. If you choose Social icons, configure the icons at Customize > General > Social links. See the Related Articles for more information. Enable a parallax effect in which the footer widgets and footer are revealed as the end of the content scrolls up. 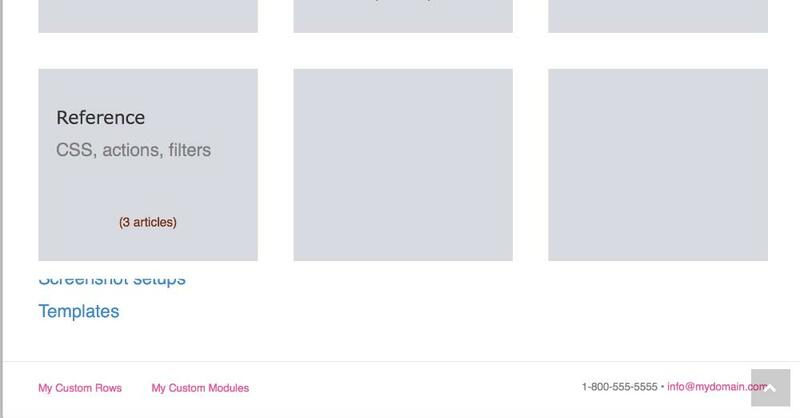 In the following example, the content (gray boxes) is moving up as the footer comes into view.